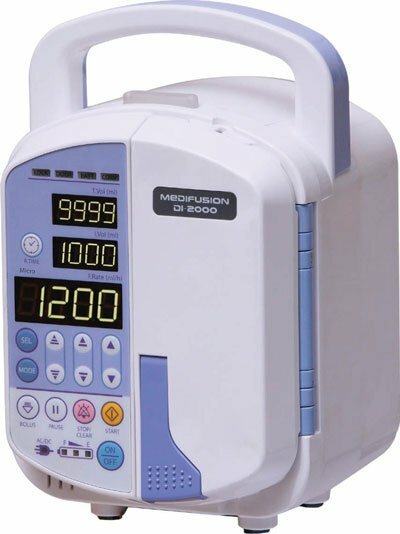 This pump provides a constant rate infusion of whatever fluids are required. We use it in our theatre with all patients that are on anaesthetic. The pump works very well with larger volumes of intravenous fluids such as saline. It can also be used with smaller patients that require a low flow rate. It’s not so much a drip pump that can be used with very small volumes. It’s virtually a set-and-forget instrument as it monitors itself. There are a number of different alarms if anything is out of the ordinary. Alarms will sound if there’s a blockage or the pressure’s too high, or it’s come to the end of a particular time period. We chose to lease this piece of equipment from MediQuip. All the maintenance, upkeep and any repairs are all covered by the lease. The only condition is that we purchase a certain volume of consumable infusion sets per three-month period. These units can be quite expensive to purchase and then any maintenance or repair issues would be at your cost. It is worthwhile to investigate the leasing options through MediQuip. We’ve been very happy with our arrangement. The biggest negative is that it is very, very sensitive to air in the line and will alarm quickly. It will pick up such minute amounts of air that it can sometimes be difficult to keep running.